We're entering the final few days of the Accursed Kickstarter. It's been a wild ride, and we've received fantastic support. Right now, we've reached more than 180% of our funding goal. This is fantastic, as it allows us to do so much more with the setting. Thanks so much to everyone that's helped let people know about the world of Morden. Throughout the Kickstarter, the Accursed RPG web site has been steadily updated with more and more information about the setting. Over the last week, that's included a number of blog posts focused on providing additional adventure hooks. If those are of interest to you, we're willing to provide many more. However, we've set a goal that we need to achieve first before we commit to doing that. We need to get to 500 likes on the Accursed Facebook page. If we do, we'll keep updating with at least 3 more adventure hooks each week for a full year. 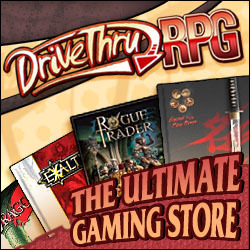 Finally, Melior Via is participating in a charity bundle on DriveThruRPG. All proceeds from bundle sales go directly aid victims of the Colorado flooding. It's a great bundle, currently featuring well over $200 worth of ebooks for a $20 price tag. Please consider contributing, as the incredible value can also be extremely helpful.